We partner with two Las Vegas churches located in low income neighborhoods to provide daily hot meals to seniors. The partnership has resulted in partners providing more comprehensive services to seniors, such as companionship, Bible studies, games sessions, and other services to meet their multiple needs. 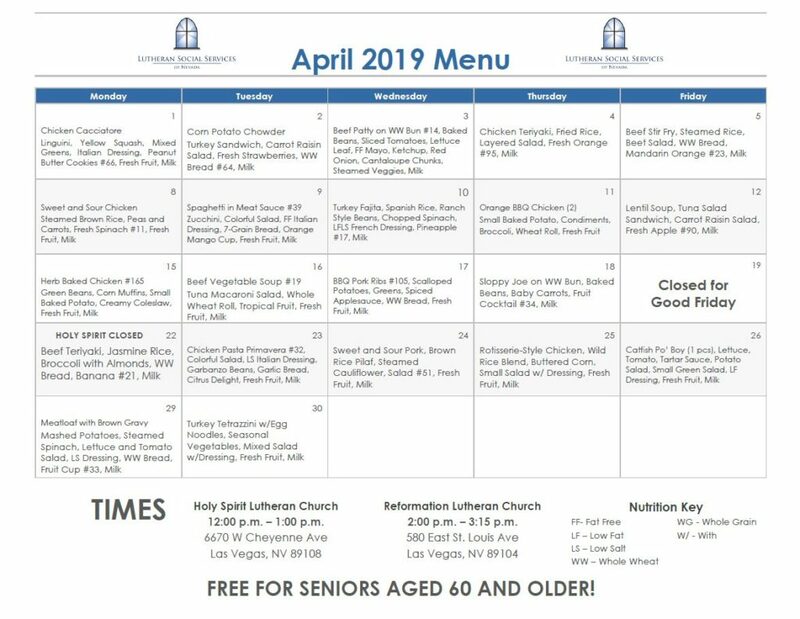 Hot meals are served to seniors from 2:00 PM to 3:15 PM at Reformation Lutheran Church and at Holy Spirit Lutheran Church from 12:00 PM to 1:00 PM. Seniors (60 and older) eat for FREE or can donate towards the meal (not required). Non-Seniors (59 and under) can donate $5 at the registration desk. To sign up for this program, please visit one of the locations below and complete the application process! Want to see what is on the Menu? LSSN is also looking for volunteers that are willing to obtain their Safeserv certification and Food Handler card to assist with the meals. Interested volunteers please click here.